Veronica Davidov grew up in the former USSR, moved to the States as a teenager, and now lives in New York City. 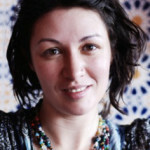 She is an environmental and visual anthropologist who does research in Ecuador and in Russia. She co-edits Laboratorium: Russian Review of Social Research. I think of immigration in my subsequent, adult life, not as a determinant but something akin to the zodiac sign if one believes in astrology. Letting go of Communism and the Socialist dream was not the interpretation Russian audiences reached for. And that makes sense—ending a theatrical segment entitled “Dreams about Russia” with the fall of communism is very, well, retro.